Is PepsiCo a Buy for 2019? Investors might want to keep the beverage and snack-food giant on their watch list for now. It's one of the biggest, most profitable businesses on the market, having booked over $10 billion of operating profit in its last complete fiscal year. And PepsiCo (NASDAQ:PEP) brings many other attractive qualities to the investment table, including a diverse revenue stream powered by a portfolio of hit global consumer brands. Investors also benefit from a capital allocation policy that's boosted shareholder returns for decades. The company is struggling to find consistent growth sources today, though, both in its beverage division and in its consumer packaged-foods segment. These challenges help explain why the stock has underperformed the broader market lately. With that bigger picture in mind, let's take a closer look at whether Pepsi might make a good buy as the company looks to update its strategy in 2019. Investors have had some good reasons to watch Pepsi shares from the sidelines lately. The company's organic sales got just a 2% boost overall in fiscal 2017 to mark a sharp slowdown from the prior year's 4% uptick. Like its key beverage rival Coca-Cola (NYSE:KO), Pepsi has had to make major portfolio adjustments in response to shifting consumer tastes for sweetened carbonated drinks. The company hasn't always kept up with the wider market, though. The good news is Pepsi's snack-food segment has provided a valuable offset to those challenges. However, that industry niche is also going through its own tricky demand shifts while facing spiking commodity costs. Sales have improved slightly in 2018, but not by enough to change the wider operating picture that pairs modest growth with flat profits. Organic sales are on pace to rise by about 3% this year, while operating profit has been flat over the past nine months. There's no reason to worry about Pepsi's rock-solid financial position. In fact, the company is on pace to generate $9 billion of operating profit in 2018. 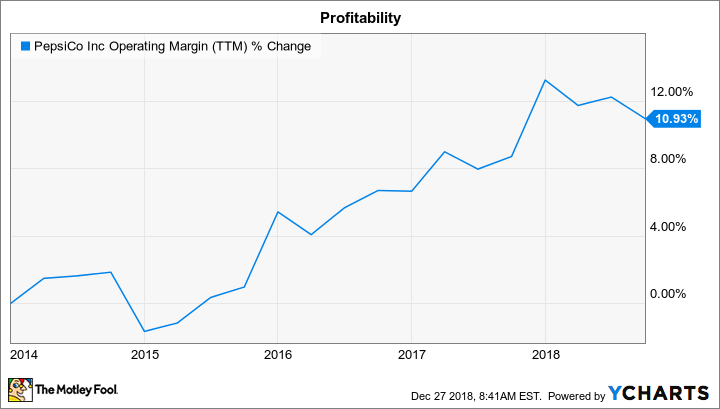 And thanks to aggressive cost-cutting, the wider business just set an eight-year high for profitability as operating margin passed 16% of sales. PEP Operating Margin (TTM) data by YCharts. These successes lay the groundwork for big returns to investors. After investing about $3 billion back into the business in 2018, for example, Pepsi is looking at $6 billion of free cash flow that it will direct back to shareholders. Pepsi's latest 15% dividend payout boost confirms that management prioritizes increasing those cash returns. Executives plan to supplement the dividend with stock buybacks totaling around $2 billion. In total, the company should deliver about $7 billion to investors for the year, representing nearly 5% of its market capitalization. Pepsi's future is less certain than in normal times, and not just because the company is still working to reposition key elements of its brand portfolio. The business is transitioning to a new management team, too, with CEO Ramon Laguarta stepping in for Indra Nooyi, who just retired after 12 years at the top spot. It's possible that Laguarta will take a measured approach to running the business, one that seeks to pair modest growth from its two dozen billion-dollar franchises with cost cuts and a few tack-on brand acquisitions. On the other hand, Pepsi could make major strategic changes similar to the bottler refranchising move that Coca-Cola recently completed. Such changes could change the investing thesis for Pepsi away from its current focus on steady but modest growth paired with rising cash returns. Yet investors won't have a good idea about management's updated thinking -- let alone whether Laguarta and his team can implement the new strategy -- until the next few quarterly earnings have been reported. Thus, Pepsi stock might make a better watch list candidate for now.